By and large, technology has been an incredible tool for learners with a disability, improving their independence and allowing them to utilize resources that they wouldn’t have had access to in years past. However, it hasn’t been a perfect solution. Many types of tech also come with barriers that can make it difficult for those with certain limitations to access the information they need. To ensure that all public institutions are doing their best to remove those barriers, there are a wide range of laws designed to protect those with disabilities by mandating how and when institutions must provide accommodations. To ensure that you’re following the rules, it’s critical to know just what those rules are. We’ll give you a quick rundown here, but you can always find more information through governmental resources and get help with any questions you may have from Access and Accommodations. There are a few different laws that outline what all students can expect of colleges when it comes to a good faith attempt to make courses available and usable. Here are those that you should be familiar with. Often shortened to just the ADA, this act is a well-known piece of legislation when it comes to discussions about accessibility, offering broad protections to anyone with a disability. Title II and Title III make it clear that all public institutions must be accessible by those with disabilities unless doing so creates an undue hardship. Title II: Governmental organizations must ensure “effective communication” with citizens, including providing assistive technology or services as needed. Title III: Prohibits disability discrimination by “places of public accommodation.” This includes all public institutions but can also include private institutions that meet certain criteria. Any institution that receives federal funding or federal grants must abide by the Rehabilitation Act’s guidelines. The most relevant of these to accessibility on college campuses are section 504 and 508. Section 504: Requires all federal entities, as well as any organizations that receive federal funding, to make accommodations for equal access. Section 508: Requires electronic communications and information technologies, such as websites, email, or web documents, be accessible. Videos must also provide closed captioning. The Twenty-First Century Communications and Video Accessibility Act of 2010 (CVAA) updates federal communications law to help improve the accessibility of modern means of communication. This law may not directly affect your individual courses, as content created specifically for the web is exempted, but it is worth knowing about if you want to use content for your course that has been created for another medium (TV or movies) and is being shared or sold online. These videos must be captioned. There are state laws that govern accessibility, too. The Illinois Information Technology Accessibility Act (IITAA) requires Illinois agencies and universities ensure that their websites, information systems, and information technologies are accessible to people with disabilities. It expands on the requirements of the ADA and the Rehabilitation Act by establishing specific standards and encouraging proactive rather than reactive approaches to accessibility. You can find a list of the specific standards laid out on their website here. WCAG started out as a set of standards for web developers to use when creating websites to ensure that they were accessible, however, in January of 2017, the U.S. Access Board approved a final rule to update the Rehabilitation Act. Under these new guidelines, an additional seventeen of the WCAG 2.0 criteria have been added to the Section 508 guidelines. Enforcement of the rule went into effect January of 2018. You can read about what criteria were added here, but they include new guidelines on webpage navigation, software programming, and the handling of audio content. Even if WCAG wasn’t law, it would be a good set of standards to follow when developing web content. It has 12 guidelines that are organized under 4 principles: perceivable, operable, understandable, and robust. For each guideline, there are testable success criteria, which are at three levels: A, AA, and AAA. We’ll discuss how to implement these guidelines in future posts. As a public institution, College of DuPage is required to follow all provisions in federal and state laws that govern accessibility so long as they would not create an undue burden on the College. 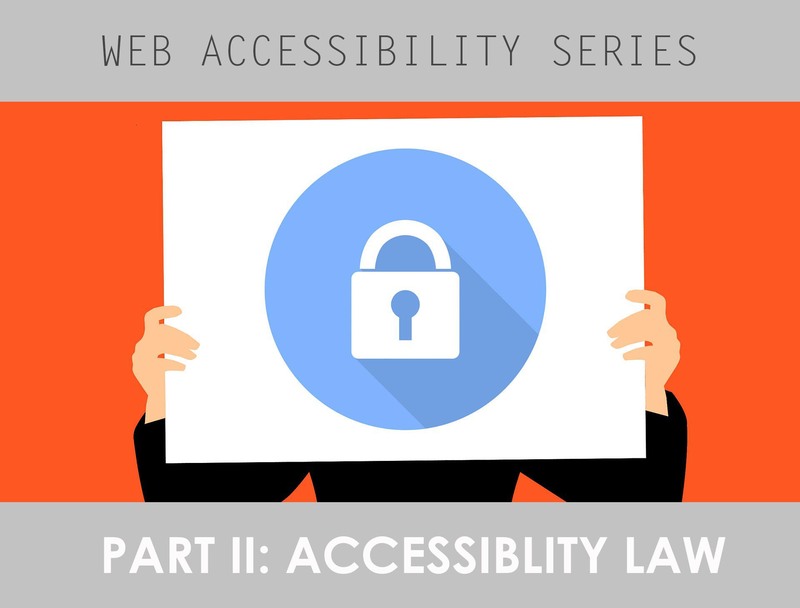 Failure to follow these guidelines can result in legal action from students or community members, as it has with other public organizations that were not proactive about ensuring accessibility. While potential for lawsuits isn’t the only reason for making course content accessible to all students, it isn’t something that can be ignored. Over the past decade, more than 37 colleges and universities (you can find a list here with details of the cases) have all faced civil rights complaints over the accessibility of their educational content or the information technology used in their courses. These cases offer a valuable example for how other institutions of higher learning can avoid ending up in a similar situation, and take preemptive actions to ensure that their content is accessible to all students before it ever becomes an issue. If you feel that any aspect of your course might not meet the standards set out by these laws, the time to take action is now. In future posts, we’ll discuss how to ensure all documents (everything from PDFs to PowerPoints) in your course are accessible, explain how to get videos captioned, cover best practices for web accessibility (especially with regard to Blackboard), and give you a helpful checklist for evaluating your courses. If you want to get moving forward on these issues sooner rather than later, you can make an appointment and we can help you evaluate your course content for any potential issues. This entry was posted in Accessibility, Blackboard, Features and tagged Accessibility, Blackboard, Law, Online Learning, Online Teaching. Bookmark the permalink.